Olga Komissarova: "Through my art I love to send positive messages – but not necessarily in its literal meaning, often in the emotional feeling that it gives, which I achieve through the color, compositional balance and attention distribution clarity of the piece." Sarasota, Florida: Olga Komissarova, 2012. One-of-a-Kind. 4.5 x 4.5" closed, opens to circular structure of 9" diameter. Original illustrations in watercolor and black ink. Ribbon closure. Signed and dated by the artist. 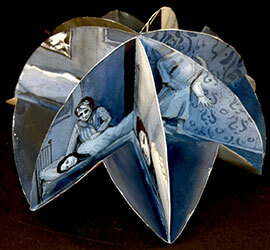 "The book is handmade and has a circular binding, which flips easily into a pocket-size quarter-circle. The book serves as a constant reminder of the circles we go through in life and our ability to see them from the outside. The mood of the book is blue, so the illustrations are done in cold and deeply sad blue colors.